I have been very fortunate over the last 37 years to be able to work on just about every type of mechanical and quartz watch that you can think of. Everything from a Timex to a Rolex and everything in-between. After thousands of watches, it is understandable that I would have a favorite. 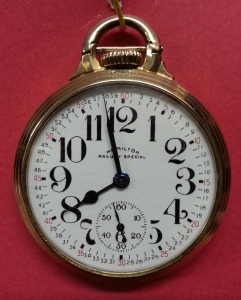 My all time favorite watch is the Hamilton 992B pocket watch. You might think that I would pick a Rolex Datejust or maybe an Omega Seamater, but for me there is no greater pleasure than working on a good Hamilton pocket watch. There is absolutely nothing fancy about the 992b, it is just a good solid, well thought out design that runs well and very rarely gives you many surprises. It is easy to replace the balance staff(not my favorite job) the mainspring is also easy and inexpensive to replace. Best of all, it just does its job and runs well. It is a bit like a sturdy pickup truck, nothing fancy, just built to work hard very day without a lot of hype and fanfare. One of the best things about a 992b is how pretty it sounds. 21 friction-set ruby and sapphire jewels. All upper jewel settings are gold. The center wheel is round arm gold, and the third and fourth wheels are round arm gilt. The escape wheel is steel. Factory adjusted to keep accurate time in all 6 positions. 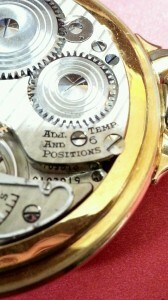 992B has the new Elinvar Extra hairspring. It is white; the older regular Elinvar hairsprings were blue. There was but one 992B movement at any time, but you could order it and today you can put it in an almost unlimited number of cases. I would enjoy hearing from all my customers on what their favorite watch is. I will compile a list and post the results in a future blog post. hi mark, I too love the old pocket watches, so much in fact I bought two from you a couple of years ago. both a Hamilton 992 and a 992B. they are gorgeous and I show them off every chance I get. they still keep perfect time and are just beautiful. My favorite is the 992b also , I have a large collection of them along with the 992s. And if I had too much money, the Rolex Daytona also, of course. You’re exactly right about the 992B. I own three of them, a ’41, ’51, and ’61 (which you will be getting in the mail next week). They’re like those old 1980s Mercedes diesel cars, they are simple, not many frills and they run forever. The ’41 and ’51 keep railroad time even today. While I generally carry an 18s 23j Elgin Veritas, my Hammys are the centerpieces of my modest collection of railroad watches, and that includes a 1921 Ball-Waltham. 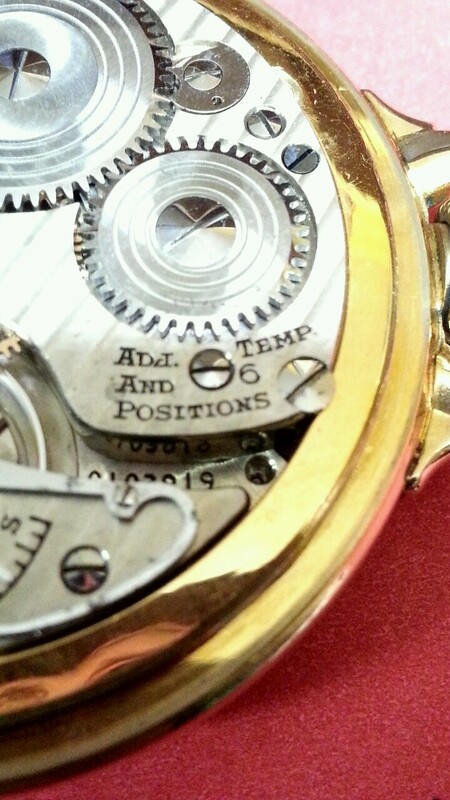 There’s just something enduring about a watch that the US Army wrote a tech manual about. For me personally it is the 4992B. I was lucky enough to grab 2 of them a few years ago before the price started going up. One of which you serviced for me after i acquired it. It is still running great and my friends are tired of hearing me brag about it! Also a great watch, I like the hack feature. Lots of history behind that one..
My favorite watch is a Bulova quartz with a yellow-and-gray honeycomb pattern dial. Mark, What would be your “Pickup truck” Wrist watch be? Enjoyed reading your post. Do not stop any yime soon! My favorite is the Planet Ocean. But I must confess I have always liked the old Orients…. What are the differences between the 992 and 992b? I understand it is more than just the improved spring. My favorite is my 992B that you repaired for me. I used it a number of years as a railroad brakeman many years ago when it was required of operating employees and before the days of the quartz wrist watch. As they say, “Those were the days…” when I spent a lot of time between Chicago and Milwaukee and Chicago and Madison and even many days switching boxcars in the industrial districts of the city and just west of the O’Hare runways. Times have certainly changed in the industry, but my fascination and interest never lagged. My Hamilton reminds me of those days every time I look at it. I think the pocket watch I really enjoy the most is the 23 Jewel Illinois Sangamo Special. Excellent time keeper and ruggedly built. Fairly easy to work on and parts are still available. Size 16 is my favorite but I do have several size 17 Sangamos. Illinois just didn’t make any Junk. And, neither did Hamilton. 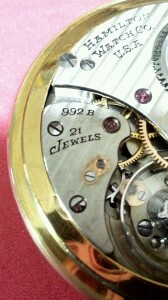 I agree, 992Bs are great movements and excellent time keepers but my #1 is still the Sangamos. Hi Mark, agree with you about the 992B sound. My 992 that you fixed last year runs great, and I love the sound. 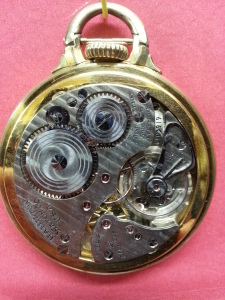 The workmanship on the movement is very impressive. They are also my favourite pocket watch. You have serviced them both. Thank you. Great article Mark. Favorite watch Hamilton anything. I just love the history that comes with the Hamilton name, classic. Really excellent history lesson. Mark, you never cease to amaze me at the information you retain and share will all of us. Many thanks. Great blog, Mark. Really enjoyed reading about the Hamilton. I have a Hamilton wristwatch that I inherited from my father-in-law. Not expensive, just a beautiful little watch that’s lasted for the last 80 years or so. Thank you for fixing my Rolex,oyster perpetual date just. Have to admit I was more than a little nervous about sending my Rolex off in the mail to someone I really did not know. Could not be happier,runs like a new watch and looks like the day I bought it. I have Hamilton 950b is it better then a 992b? Living in Lancaster I follow the Hamilton brand. The factory is a apartment house now. Was once one of the best places to work. A practicing watchmaker for 55 years.Still working at Rolex South Africa.Used to live in California,where I had my own business. 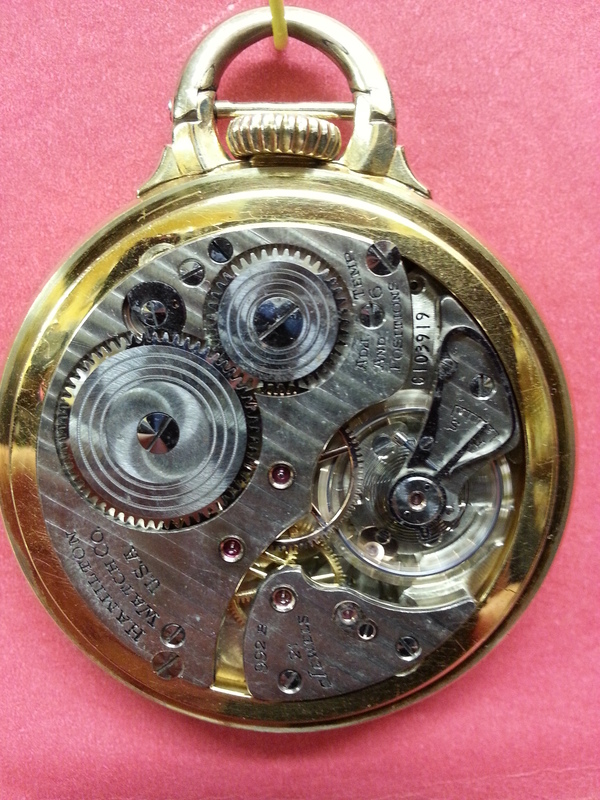 Specialized in Pocket watch restoration. You are so correct in saying the 992B is such great movement.Also my favourite. Loved working on them.American pocket watches were some of the finest ever made.Also have the cal 23,which I have just restored. Beautiful movement and design. I am so excited to find your posts. My grandfather was a railroad conductor on the Erie Lacawanna (spelling) Rail road for over 50years. He did varies things doing his time on the rail road, from 1901 to the time he died. My grandmother, gave me the watch, that I played with so many times. Or should I say opened and closed. My granddad..like you loved the sound. He’d put it to my ear many times when I stayed there and he’d say listen to this baby hum…and imagine the sound of the wheels of the train as they roll along the track…ticking off the time. Thank you for posting the video sound bite…Wow brought back so many memories. The watch was a gift to him, but what year I do not know. It has an inscription on it. And it is in fact a 992B…and the only reason I know that is becauce he said in Sept 2, 1899 was when he decided he wanted to ‘keep time to the riding sound of the rails.’ Beautiful watch. Today is Nov 4, 2018 amd I still have the watch and it is still running beautifully. And every time I open it, it listen to the sound and remember my granddad who loved the watch and his job on the rails until the day he died.